Jason Bourne (2016) Movie Review | Is Bourne Still Great After 10 Years? After a long wait, director Paul Greengrass and actor Matt Damon have returned for Jason Bourne. With The Bourne Supremacy and The Bourne Ultimatum, the filmmaker forever changed how creatively bones can be broken on screen and in doing so has left Jason Bourne’s audience expectations high. In fact, more than any other film in recent memory, Jason Bourne exposes the dividing line between audience expectations and the actual vision a director has for his or her movie. Jason Bourne picks up a decade after The Bourne Ultimatum and finds the titular character hiding out in Greece. Bourne’s daily schedule includes bare knuckle fighting, constantly looking over his shoulder and living in a dank apartment building (Bourne is always finding himself holed up in one of those). The film then cuts to series veteran, Nicky Parsons (once again played by Julia Stiles), sneaking into a dank computer lab in Iceland (dank very well may have been the main word used by the film’s production designer). Parsons attempts to hack into the CIA’s mainframe and find information for an Edward Snowden-type (Vinzenz Kiefer). Although she is trying to dig up dirt on the CIA, Parsons ends up discovering a document that links Bourne’s father to the Treadstone operation. While Parsons is hacking, Cyber Ops leader Heather Lee (Alicia Vikander) is able to track Parsons’ whereabouts. 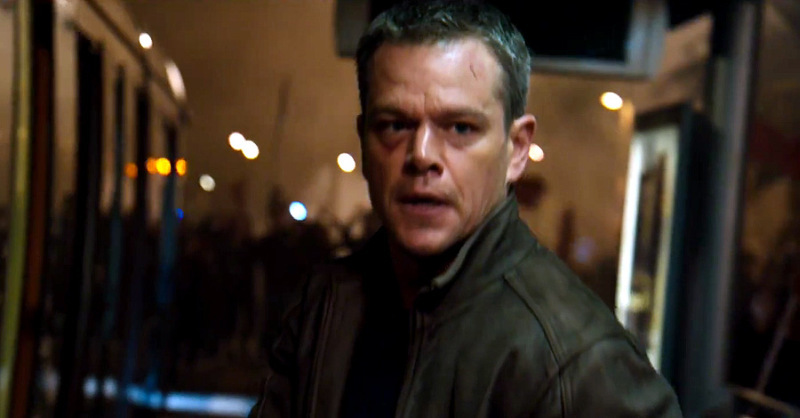 Working in tandem with CIA director, Robert Dewey (Tommy Lee Jones), Lee deduces that Parsons intends to contact Bourne. A Bourne movie would not be the same without a pack mule to hunt down Jason. 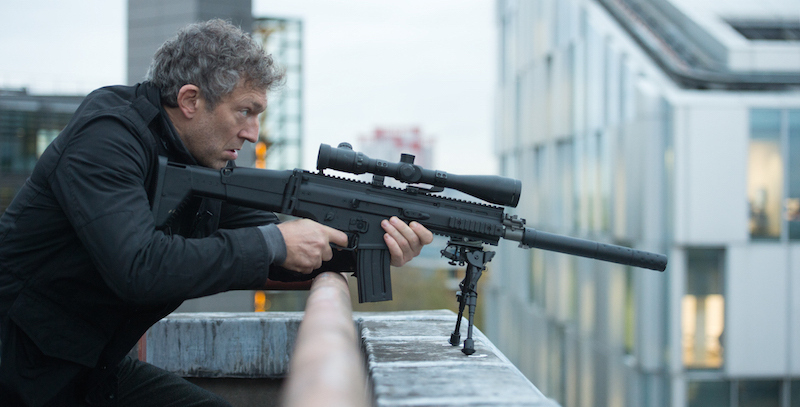 Enter Vincent Cassel’s The Asset. 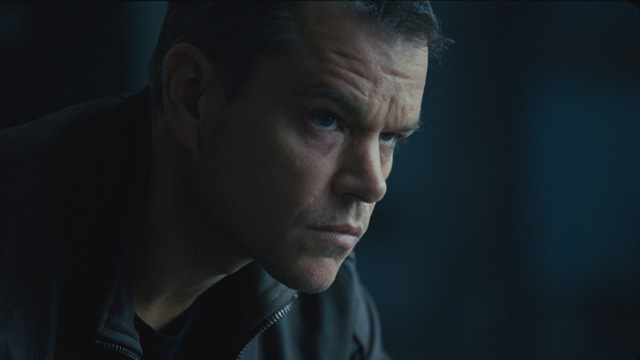 Obviously too cool for a real name, Asset spends majority of his screen time hunting Bourne through different rooftops and streets across the world. There is another storyline involving a Mark Zuckerberg-like character named Aaron Kalloor (Riz Ahmed). Kalloor operates a Google-type company and Dewey uses the search engine to give the CIA twenty-four surveillance on all of its users. Somehow these disparate storylines are supposed to connect and end up in an epic showdown at a nerd expo in Las Vegas. Here’s the thing. I am even getting a little bored just summarizing all of this. It pains me so much to say that I found a Bourne movie boring. But look, I get a lot of the narrative choices made by Greengrass and co-writer Christopher Rouse (also the film’s editor). The Bourne franchise has always engaged in current affairs and tackling the fear of the government’s omnipresent meddling through the Internet is very current. 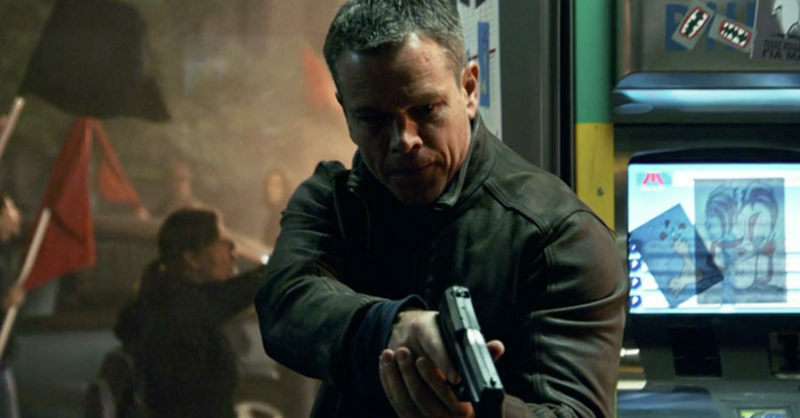 The difference between the way past films in the series dealt with hot topics and Jason Bourne’s approach is that the previous incarnations treated it like window dressing. Oppositely, this movie spends a lot of time dwelling on its political topic (often threatening to take up more time than Bourne’s own story), but it thematically builds to nothing more than a sly point about Bourne’s way of being a spy is old-fashioned. And this is where I want to bring up expectations versus a filmmaker’s vision. Well my expectations at least. If one were to look at other reviews of Jason Bourne, one would see there is a critical consensus that making another Bourne movie is conceptually a bad idea. Not to me. I am one of those fans who wanted to see another Bourne film with Greengrass and Damon back in the driver’s seat. The reason why I wanted another Bourne film was because I thought last three films ended Jason’s arc on a great note for future thematically possibilities. I had questions. What does Bourne do now that he has more-or-less defeated Treadstone? 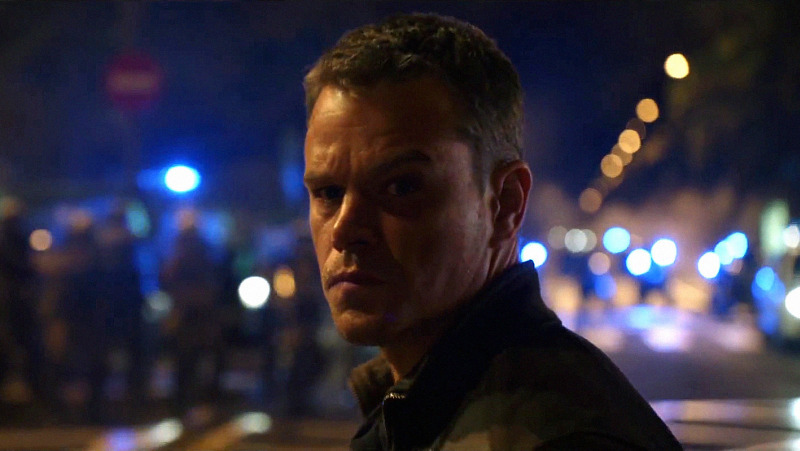 How would a slightly older Bourne assimilate to a new life? I know this sounds a lot like my own fan fiction, but these were my expectations for Jason Bourne. Even though the film brushes on the concept of what it means to be a seasoned killer (Cassel is made up to look a little older than his real age), it never deeply delves into that notion. Which is fine because that is clearly not the film Greengrass wanted to make. There is a lot of small story beats like this that are uncharacteristically miscalculated by a filmmaker as talented as Greengrass. Also, the film’s bigger narrative does not feel like a piece to a larger whole like the previous movies (Let’s be honest, there is going to be sequels). Here’s the film’s biggest mistake: It does not meet the expectations of great action that the series has always showcased. I can go on about how the Bourne series dabbles in real life topics and attempts to be a bit thematically deeper than the average action film, but people really see these movies for the amazing fight scenes. Although Jason Bourne has plenty of action, they never reach the monumental heights of something like Ultimatum’s bathroom brawl. Greengrass brings back his shaky cam approach to the fight scenes that made the series so aesthetically influential all those years ago. It could be argued that because the hand held camera approach has been adopted time and time again in subsequent films is the reason why Jason Bourne’s action never really pops. I do not think being jaded by the camera work is what turned me off. Rather, it is that the action is sparse and the film’s giant set piece completely undercuts what usually makes the Bourne series’ action so memorable. All of the stunt work is well done, but the entire sequence is a bit broad and feels more like a piece from Fast and Furious. The greatest approach to the Bourne series’ fight scenes has always been the feeling of intimacy. Intricately choreographed fight scenes involving only two guys duking it out. Jason Bourne features a hand-to-hand fight scene after the Las Vegas chase, but it feels completely tacked on. I have not delved into the performances. Each of them is fine, I suppose. Tommy Lee Jones and Alicia Vikander are honestly given nothing more than to look angry at computer screens. Although, I must say that Vikander plays her role with just enough enigmatic quality that I would not mind seeing her in a future installment. Vincent Cassel tries his best with the material given and physically throws himself into the action every chance he is given. 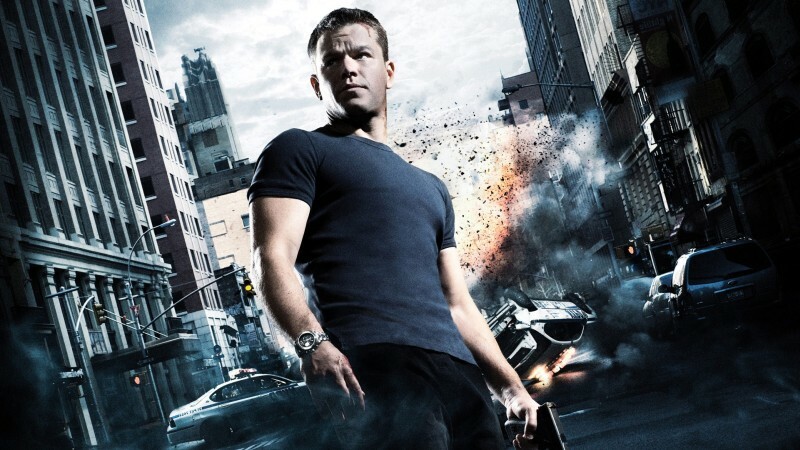 Expectedly, Damon owns Bourne and plays the role with a new level of grit not found in the previous movies. My own and the rest of audiences’ expectations were high for Jason Bourne. Unfortunately, what has ended up on screen is something that attempts to tie in two stories that have little to do with one another and an action movie that has very little exhilarating action. With that said, I have not lost faith in this franchise. I believe Greengrass is still one of the best action directors of the 21st century and I am for now viewing Jason Bourne as a movie to clean up shop for something better. I am eagerly waiting to see if Greengrass and Damon will course-correct Bourne for another installment.